As the hot water hit my sweaty and salt-crusted hair, I started sobbing. I had no idea finishing my first 50k run would be so emotional, but as the warmth of the shower reached my neck, my back, and finally my tired legs, I realised I was no longer in control of those emotions and let them flow down the drain with the dusty salty water. Half an hour earlier I'd finished the 50km race at Ultra-Trail Australia 2018, my first ultra marathon. It'd taken almost 8 hours to run 50km, descending then ascending over 2,400 metres including over 8,000 steps. My body felt battered and my mind was broken. UTA was back in May, 4 months ago as I write, but the overwhelming feeling of exhaustion and satisfaction still feels fresh and raw. I don't think I underestimated the ultramarathon distance, but there is no way to know how you will respond to it until you're there. Entries for the 2019 running of UTA open tomorrow and I'm quite content to let it sell out without my name in the mix, but there is no doubt that 2019 will see me run to 50km and beyond. Hell, I was the very first person to sign up for the 56km Two Bays Trail Run, from Cape Schanck to Dromana return on Melbourne's Mornington Peninsula, next January. So how did I end up sobbing in the shower? Like all good stories it started with beer and pizza. Over a few pizzas and more than a few craft beers, 4 of us from DCR had decided to run UTA50. Darren, Paul, Lachlan and I decided we were going to sign up, train, travel, and race together for our first UTA experience. In the cold sober light a few days later, entries opened and we paid our dues: the event sells out in a week so you've got to commit or get off the pot! We'd all seen the promo videos and we weren't going to miss our chance. Having mates join you on your training journey is such a valuable experience. Whilst two of our clan had run 56km races, the other two of us had tapped out at the marathon distance. I was the relative newbie in the group, having done precisely one marathon. We were able to line up our training schedules well enough so that those long, lonely training runs were done as a group and those painful hill or interval sessions were largely done with the Diamond Creek Runners, a large group helping keep us honest. Mt Buller Skyrun 36km, coming down Mt Buller's "Bourke St" ski run (in the summer!). L-R me, Darren, Paul and Lachlan. Photo: Ian and Velta Fellowes. 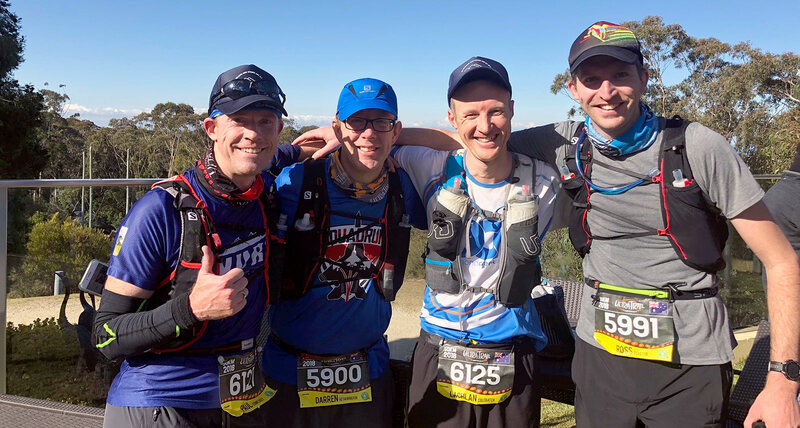 In April, 6 weeks before tackling UTA in the Blue Mountains, our merry crew ran the Mt Buller Skyrun in Victoria's ski fields. The 36km race had some similar elevation challenges to what we expected at UTA, and the 6+ hours that it took to complete helped us dial in nutrition and hydration. It also gave us a chance to get the goofy half-jump shot above! With each of us taking something different away from Mt Buller I think we were ready to finish our training and travel to Katoomba. When race weekend came along we flew to Sydney, drove out to Katoomba and found our Airbnb - which happened to be midway through renovations. That wasn't in the listing... We checked in at race HQ, got our race numbers, visited the expo, and had lunch while observing some rather odd locals. Night time bought the race safety briefing, a short pub dinner, and some anxious sleep. The start line of any big race is always a quietly tense place. There's thumping loud music and some anxious chit-chat, but for the most part you're quiet, nervous, and a tad excited. The nerves tend to take on a mind of their own when you're taking on something new - or something as big as UTA. As the countdown reached zero we took off at a slow jog. The first few kilometres of the UTA course are out-and-back on residential roads, giving you some gentle running to warm up the legs and spread out the large start group. With thousands of runners on the trails, you want a bit of space to yourself before hitting the singletrack. It was here that I realised one of the extra values of Darren's Squadrun training programme: most of the Squadrun clients wore trademark-blue Squadrun tshirts, leading to a collection of strangers cheering each other on with yells of Squaddie! every few hundred metres. It was a really fun way to start the run. At the 7km mark the course reaches trail for the first time. Winding along the clifftops from Katoomba to Wentworth Falls, the run takes in every postcard view of the Blue Mountains including natural gems like The Three Sisters. This is what we've come for. The trail climbs up and down, takes in stairs up and down, and as we came into the first aid station at the Fairmont Resort there were crowds cheering us in, there were marble-lined toilets, and there was food. Sweet sweet food. The crew together at 17km, the Fairmont Resort checkpoint. After this point we started to spread out a little. After the Fairmont we returned to the single track and started to spread out a little. Paul had been battling injury for a few weeks and was slowed down as a result, and Lachlan was starting to get some ITB pain. We pushed ahead, crossed the Wentworth Falls waterfall after about 25km, and regrouped at checkpoint two, the site of the abandoned Queen Victoria Hospital. By now Paul had dropped back a bit further and Lachlan caught Darren and I. We tucked into the food on offer, took on some sweet sweet coca-cola, and refilled waterbottles. It's hard to state just how beautiful the trail is from Katoomba to Queen Victoria. There is absolutely nothing here in Victoria that compares with the variety of trail surface, the incredible views, and the world-renowned landmarks that we were passing. For this reason alone I would recommend UTA50 to any runner! After Queen Victoria Hospital the course joins fire trail and descends from the Kedumba Pass to Jamison Creek, around 8km of constant steep downhill. On most runs this would be pretty welcome but Darren had pointed out at the checkpoint that we had only done half of our total climbing for the run - so another 1200m of climbing was going to face us once we reached the creek at 35km. Darren and Lachlan both flew down the Kedumba Pass, and for the first time in the race I ran alone. It was an odd experience to be alone with 20km of trail ahead of me: most of my training was with the DCR crew, and the first 28km of the run had been with at least someone else from our little group. I tried not to let it get into my head too much, and kept pushing downhill. It goes without saying that 8km of downhill starts to hurt your legs. Combined with the unrelenting steps in the first half of the race my knees were starting to feel a bit fragile, so I was trying to carefully balance my pace vs the pain I knew I'd experience if I pushed too hard. Upon hitting Jamison Creek, the course cruelly undid my downhill running and started the climb back towards Scenic World and the finish line of my first 50km run. The steep climb never ends, with the only respite coming at the 41km mark with a drink and aid station deep in the bush. As always the volunteers were second to none. While I slowly nibbled on my Clif bar and took on water a volunteer came over and just started chatting. Not pushing me to run, not worried for my welfare, but a friendly chat. He asked if I'd run the course before - no, I hadn't - then offered his advice for the final 9km stretch. His gentle manner reminded me of Dennis, one of the DCR coaches, and he pointed out a few spots where I was going to be hurting and where I would be able to run a little to make up time. With doppelgänger-Dennis' advice fresh in my mind, I took off for my final climb: about 9km of undulating (but mostly uphill!) trail that dished up everything UTA has to offer: firetrail, single track, rock stairs, tree roots, metal stairs, and finally timber boardwalk and bitumen to the finish line. When I reached the Leura forest for the second time (at around 45km) I felt great. There were a couple of spots where we crossed-over with the 100km runners and it was brilliant to see them on their way out to run the course I was about to finish. I think I even managed to overtake a handful of sore and sorry runners on this section. Leura forest felt relatively flat, although the continuous up and down stairs eventually caused my legs to scream at me. I started getting cramping in my right knee when stepping up over rocks, which meant I head to lead with my left leg up every step. This was OK through the forest, but I still had one more challenge: the infamous Furber Steps. 951 rusty steel and stone steps to drag me out of the valley floor, back to the clifftop finish line at Scenic World. The steps are narrow enough that you can't overtake, so I ended up marching in the middle of a big group. The momentum of other runners in front and behind helps keep you moving when all you want to do is stop and stretch your legs. Halfway up, with a few hundred metres to go until the finish line, I saw Australian ultra-runner and all-round nice guy Majell Backhausen filiming for the event media. Majell is one of those blokes with ineffable positive vibes, and his cheering us on as a 'Train of Goodness' was just the inspiration I needed. On the climb up the Steps, both knees started cramping. I could no longer lead with one leg over the other, as each knee would give me a short sharp cramp when I pushed up on a step. It wasn't a whole lot of fun but I knew the end was close. Right near the top of the steps I passed a photographer, who captured the shot in the header above a split second before both knees cramped and almost bought me to the ground. Soon after, I crested the top of the Furber steps and heard the thunderous noise of the finish line. I almost tripped over two young kids who were running up the finish chute with their mum, rounded the corner, and finally made it through the finish arch. Seven hours, fourty minutes, seven seconds. 7:44:57 of movement, up and down, onward and upward, always upright and moving forwards. Crossing the UTA50 finish line with 0% fuel left in the tank. Photo: Sportograf. I collected my medal, shook hands with Darren and Lachlan (who both finished in an incredible 7:30), and went straight for the shower to wash off some of the pain and dust. Paul crossed the line around an hour later, and our clan was whole once again. Winners are grinners! The DCR clan, together again at the finish line. L-R Lachlan, Darren, Paul and I. The aftermath of the run was rather pedestrian. We made our way back to our Airbnb, picking up a few beers on the way. We ordered pizza way too late and finished our quota of two beers per runner before it arrived... but that was all we needed. After a fitful nights' sleep, Sunday was a tourist day. With the anxious energy of the run behind us we were free to explore, so after a big breakfast in the picturesque town of Leura (much nicer and less crowded than Katoomba!) we visited a handful of places through the Blue Mountains including Pulpit Rock and Govetts Leap. By early afternoon it was time to drop off the rental car (forgetting to refuel it, perhaps the most expensive part of the trip! ), have one last beer over war stories in the airport, and head for home. Over the past few weeks we've been chatting about what our race calendars might look like in 2019. An event such as UTA requires a big training commitment and a decision must be made early: if we want to run it in 2019 we have to sign up before the event sells out, likely some time in the next 48 hours. 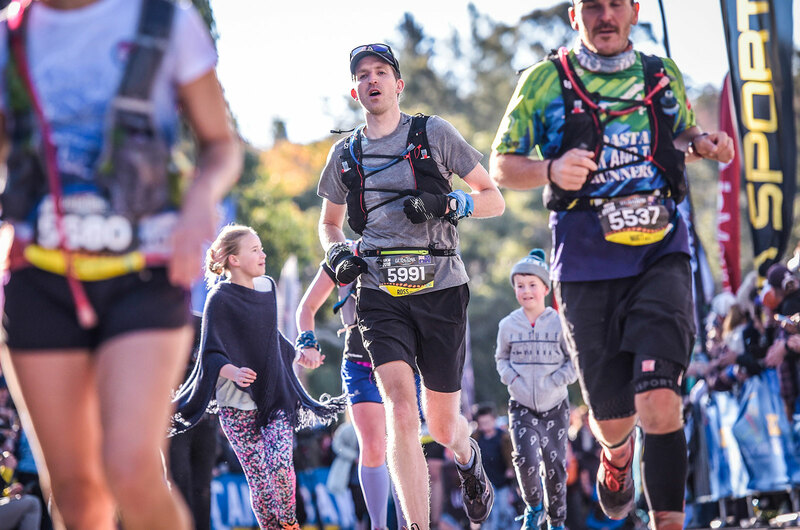 I'm extremely happy to have run my first ultramarathon, and I'm incredibly thankful that I was able to do it at one of Australia's premier endurane events with the awesome support of Darren, Lachlan and Paul (not to mention my family and the broader DCR club). The next year will see me do more ultramarathons, but they'll be closer to home. 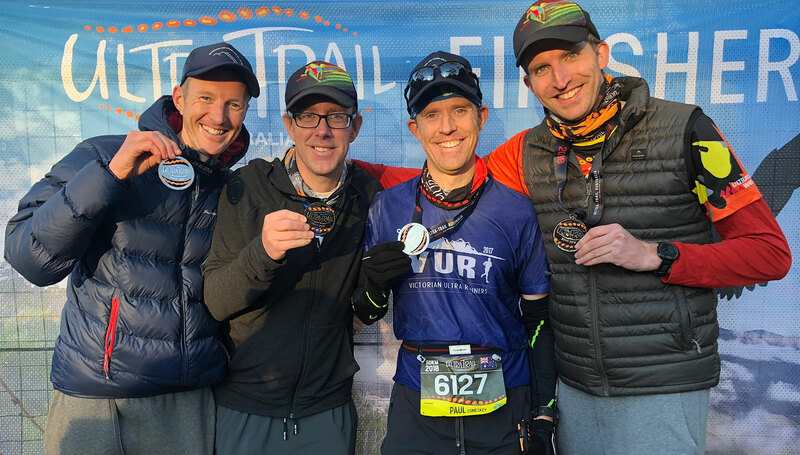 For some more insight into our UTA journey, head over and read Darren's race report on the awesomely-titled 'Trail Life Crisis' blog. He managed to write his report within a month of the run. Show off! My run is recorded on Strava, showing the elevation, my pace, and so on. Phew. Cover shot: Reaching the top of the infamous Furber Steps, 951 steep and gruelling steps that climb out of the picturesque Leura Forest to the UTA finish line at Scenic World, Katoomba. The "Three Sisters" are over my shoulder. Photo by Sportograf.